We are excited to release the first post in our 6-week Values series! When we made the big decision to SIMPLIFY EVERYTHING at Yellow Leaf Marketing, we were able to do so by putting in place a few Core Values. These, along with our new work philosophies, created a really helpful filter for us to simplify what we do and how we do it. 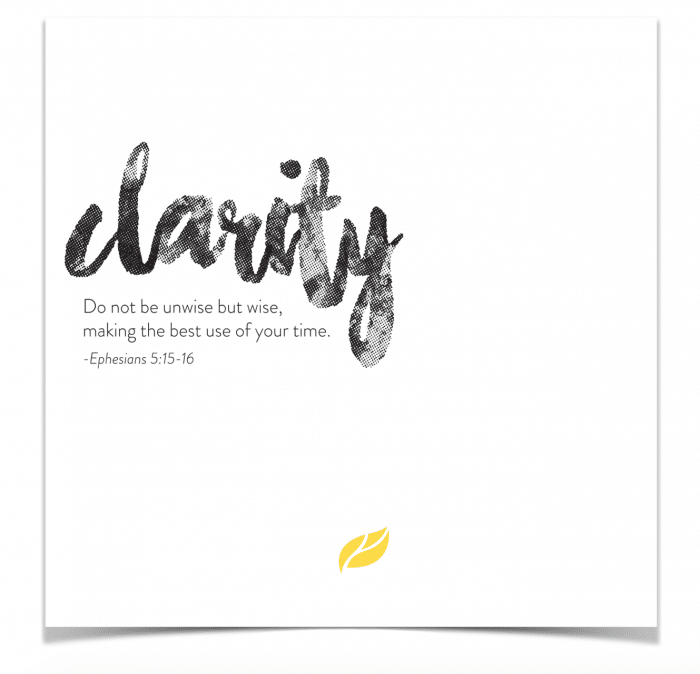 In our first Values series post, we’re going to focus on Clarity. We’ve aligned our Clarity value with our “Important > Urgent: Focus on the important – not the urgent” work philosophy for reasons we’ll get to in a minute. In a recent sermon, Pastor Matt Chandler said, “All of life is a fight for clarity.” Man, did we resonate with this. So often, all we really need in order to communicate effectively, work more efficiently, or relate personally is just a little bit of clarity. Have you ever been in a strategic planning meeting that either felt like one rabbit hole after another, or that felt like there was really no clear end in mind? As if the purpose of the meeting was just to have a meeting – to pretend like something was being accomplished? I have, and those meetings are brutal. But clarity can bring so much freedom. From planning to execution to measuring outcomes; if you’re working from a place of clarity, it’s quite hard to veer off the path laid before you. Achieving clarity in the way we talk about and lead others in accomplishing our mission is vitally important to the success of our work. This was one of the most glaring things about Yellow Leaf Marketing when we set out to make these big changes recently — We didn’t have a clear mission! We were all over the place. So often, clarity of mission serves as our rudder; guiding and steering our every decision. Without such clarity, we’re just aimlessly afloat, lost at sea with everyone jumping ship. When we begin to turn our focus from the urgent things coming across our desks and give the important things the priority, we’ll begin to work with a clear and laser-focused passion. We’re a creative digital agency who works alongside cause-driven businesses, foundations, and ministries to help you develop your identity, reach your people, and mobilize your champions. That’s who we are. That’s who we serve. That’s what we do. This little statement provides us, as a team, so much clarity. So, as you start your work week, think about some ways in which you can bring more clarity to your work, your role, and your life. You’ll find that passion and freedom will soon follow. Download it now and post it where you can see it in your office or your house and be encouraged that this week clarity IS possible. P.S. Hey, ministry leaders! 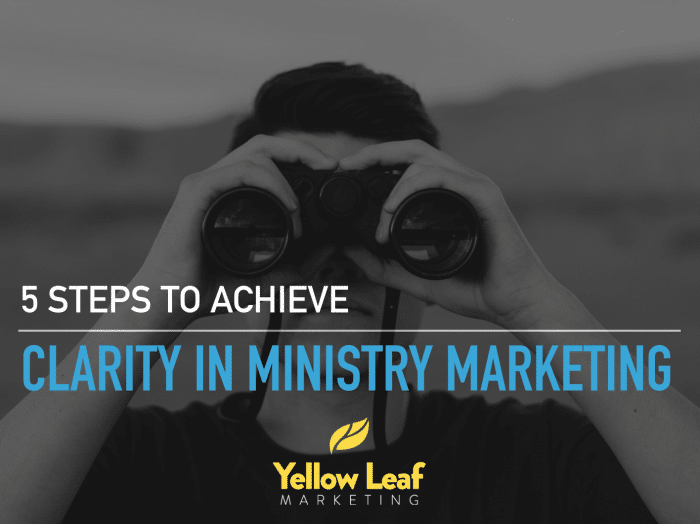 I recently gave a presentation about achieving clarity in ministry marketing. As an added bonus in today’s post, we’re giving away my slides from that presentation as an additional download. In it, you’ll find helpful questions and action steps to achieve clarity in your marketing when it comes to your mission, message, means, milestones and how you mobilize your champions. Enjoy!